One reviewer appreciated how the improved breathability of the shoe did not sacrifice a secure fit. Many runners agreed that the Dynamis had very comfortable cushioning for a stability shoe. The Mono-Sock fit system worked well in providing a soft and seamless wrap to the foot, according to a tester. Most users found the shoe to be lightweight and that it was easy to use. A user observed that their foot stayed cool and dry even when running during hot and humid weather. A lot of buyers praised the BOA® system and how it made wearing the shoe a lot easier. The outsole proved to be durable enough for daily running activities, as stated by a runner. A reviewer relayed that the thin laces caused too much pressure and friction to the top of the foot, and the lack of tongue further aggravated it. Many runners thought that the heel cup did not deliver the expected snug fit. The Asics Dynamis is an exceptional running shoe that delivers lightweight support and an excellent fit. Many runners were satisfied with their time with it, and others were impressed with the technologies that were implemented. This shoe is a good option for runners who are looking for a reliable and supportive road shoe. As you see in these 5 features bring the tech. Now all you've got to do is bring the passion. The ASICS Dynamis is billed as an explosive and very supportive running shoe that can help you to run fast and to experience speed beyond limits. Recently, I've been running in that shoe and have found it to be comfortable, nimble, and fast, all of which are qualities that any runner can appreciate. The Asics Dynamis is a durable, lightweight shoe that promises to improve speed and road performance. It is ideal for neutral to overpronators. The various features allow it to excel in treadmill sessions and long-distance road-running. The upper is constructed using seamless materials to lessen the chances of skin irritation and friction. It also makes use of the Mono-Sock® Fit System for a more accurate and secure fit. Meanwhile, the DynaPanel™ overlays target a stable ride. Featuring FlyteFoam® technology, the midsole assures responsiveness no matter the distance. An AHAR® outsole supports the midsole as it aims to deliver an improved durability while the Guidance Line® technology makes use of a vertical flex groove for an enhanced gait efficiency. The Asics Dynamis has a standard running shoe length. Runners should expect a comfortable fit in a shoe that is true to size. The toe box is constructed with an adequate width to promote a natural toe splay. The width profile available is medium for both men’s and women’s versions. Using Asics’ High-Abrasion Rubber or AHAR®, the outsole of this shoe becomes similar to car tires, thus ensuring an optimal level of durability. The AHAR® claims to be two times more efficient than ordinary rubber when it comes to abrasion resistance. This notable outsole material has been used in other road shoes like the Cumulus 20. The Trusstic® System offers stability by installing a reinforced midfoot area that averts the foot from twisting. On top of the Trusstic® system is the DynaTruss™ technology, which works in preventing compression by minimizing the amount of foam. The Dynamis construction also includes the Guidance Line®, a vertical flex groove that runs from the forefoot to the heel of the outsole. Located in the lateral area, it promotes the most efficient and most repeatable stride and decreases the risk of fatigue and injury by ensuring a consistent load from heel strike to toe-off. 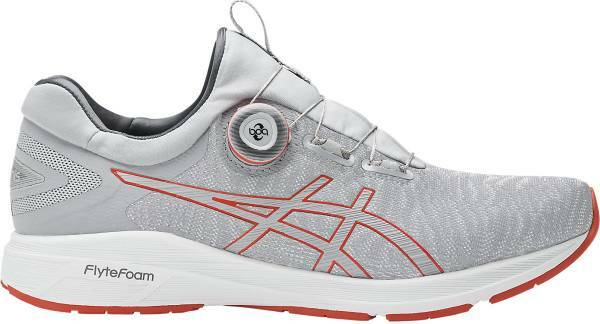 The Dynamis makes use of Asics' premier midsole foam, the FlyteFoam®, which is 55% lighter than the standard EVA foam. The highly-resilient fibers in the foam enable it to bounce back to its original shape with each stride, making it an adaptive cushioning. The FlyteFoam® is also more durable and claims to have a longer lifespan compared to standard EVA. The goal of the removable Ortholite® X-40 sock liner is to be responsive while also providing moisture management and breathability. Both these features aid in keeping the foot dry and away from bacteria. The SpevaFoam® 45 Lasting works by making the midsole softer and more accommodating, thus enhancing the shoe’s cushioning and comfort. With a seamless construction, the upper of the Dynamis offers breathability while also working to reduce friction caused by traditional stitches and seams. It is made from a soft fabric. The DynaPanels™ are thick overlays that serve as a support structure for the medial arch. They ensure adaptive stability, making it suitable for overpronators and those who just want the extra snugness. The BOA® laces that go through these overlays allow the shoe to be worn with just a turn of a dial, thus resulting in a more supportive and more accurate fit. A Mono-Sock® fit system is also in place, which means that instead of a conventional tongue, there is an internal sleeve that provides an elastic, sock-like fit.